What about your hand? Wasn’t it left naked and alone, while you took the ghost-selfie? What did your hand ever do to you? Why did you have to send your hand on such a crazy, dangerous and unnecessary mission. At least unnecessary, unless your real goal was attention, like the little whore you are. Oh, how cute. Samantha is dressed up like a ghost. That should scare the wasp. Wasp like sneak attack? He’s scared of your excessive use of capital letters, so yer safe……for now. Somehow I sense you are not mentally prepared for such an event. 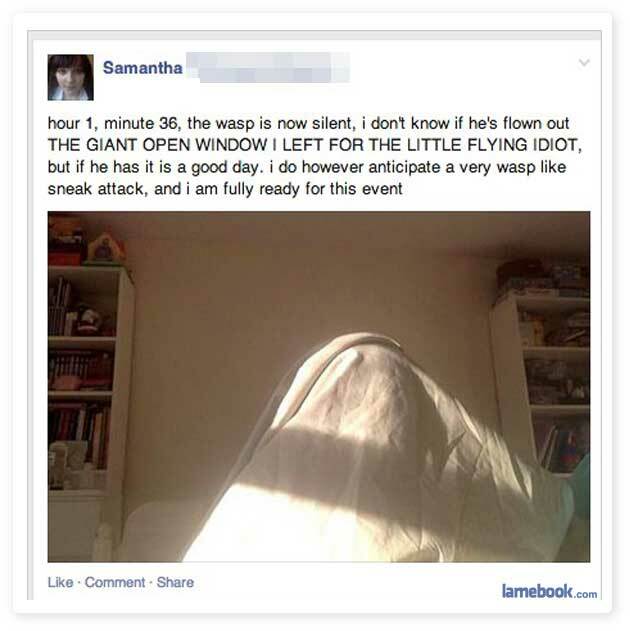 It’s no joke – wasps are my Room 101.